While students from Slytherin are known for being confident and stuck up, we have a well-kept secret. They actually have more fun than the rest of the students in Hogwarts! That's right! Gryffindor students are busy trying to right all the wrongs in the world. Ravenclaw students can hardly be pulled away from their books long enough to watch a game of Quidditch. And let's not get us started on Hufflepuff, they'd rather hand out with plants than human beings any day! There's a reason that Slytherin maintained the best Quidditch record for years before "the boy who lived" came along, it's because Slytherin has spirit! 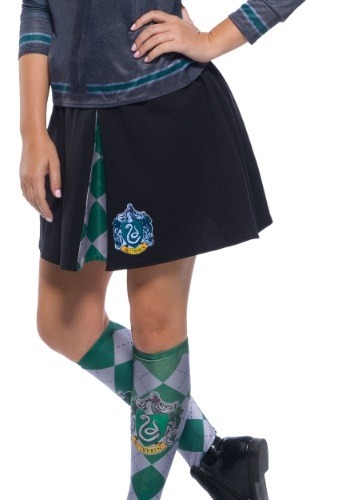 This Slytherin skirt celebrates the dignified house with a shiny green and gray argyle accent pattern. The pleats make this skirt look right at home with the rest of your boarding school uniform. And just in case folks still don't know which house you're aligned with, the skirt is stamped with the Slytherin shield. You can select other Ravenclaw accessories like the featured knee-high socks or the cozy Slytherin scarf from our Harry Potter collection to make your look complete. So, make sure you can hang where the action is at during your next trip to Hogwarts. We hear that Slytherin is at the top of their Quidditch game now that Ginny Weasley has finally moved on. There's no way you're going to want to miss that end of the year victory bash!